By the almighty God'd Grace this App contains more than 500+ Audio & Video Shabads of Panth Rattan Bhai Harjinder Singh Ji Sri Nagar Wale. ☬ Ease to play/pause audio from notification bar and lock screen as well. ☬ Search Shabads by typing keyword of shabad easily. 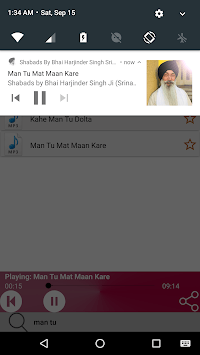 ☬ Add your favorite shabad to bookmark list for quick access. ☬ Increase/decrease sound with 1 touch. ☬ Simple and user friendly User Interface. ☬ Search any other shabad while listening. ☬ App supports 4.4 to Latest Android OS. ☬ Share app easily with others. ☬ Quickly jump to all or your liked shabads list. ☬ Watch Video of shabad or Add it to Favorite List to quickly access it. 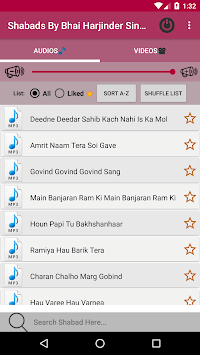 Gurbani Shabads contained in this app are sikh religious hymns. About Bhai Sahib Ji: Bhai Harjinder Singh (b. 1958) is a well known ragi and is recognised by most Sikhs globally. Bhai sahib has been performing kirtan from a very young age and is self-taught. His mission is to unite all Sikhs worldwide to the Guru's path through his special style of Shabad kirtan. Bhai Harjinder Singh is the elder brother of Bhai Maninder Singh; they are both exceptional vocalist and very able harmonium player. For almost three decades the jatha has enlightened Guru-ki-sangat in all parts of the world. Bhai sahib was honored with Panth Rattan at Sri Akal Takhat Sahib at Golden Temple - Darbar Sahib [Sri Harmandir Sahib], Amritsar Sahib. Japji Sahi, Jaap Sahib, Rehras Sahib, Kirtan Sohila, Sukhmani Sahib, Shlok mehla 9 (Salok Mehla Nauvan), Aarti and Ardas. Recorded Nitnem audio/ Sundar Gutka / Sankat Mochan Shabads. Album wise shabads in app. If you like this app Rate 5 star🌹 and put real reviews. Your reviews will spread this app on play store. Disclaimer: This app is not an official app of Bhai Sahib Ji. It was developed by one of the Fan of Bhai Sahib Ji.